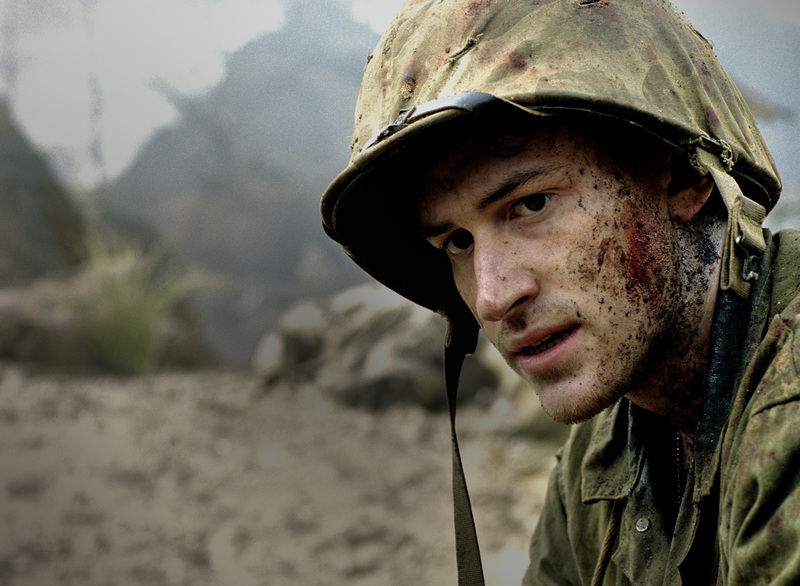 The Pacific versus Band of Brothers: Should we compare? I finally got to watch the last episode of The Pacific. Even though I had an entry on it a while back I didn´t feel like writing about it before I had seen the whole series. It proved to be a good decision since I couldn´t really appreciate it at first. I couldn´t help myself, like so many others, and compare it constantly to Band of Brothers. Apart from being a HBO miniseries produced by Spielberg and Tom Hanks, opening with men who were there talking about their experiences, those two series have nothing in common. Sure they both show a lot of very intense and gruesome infantry combat scenes but that is that. Band of Brothers, as the title eloquently indicates, was about a close-knit group of men, one Army Infantry Company. This is not the case in The Pacific. 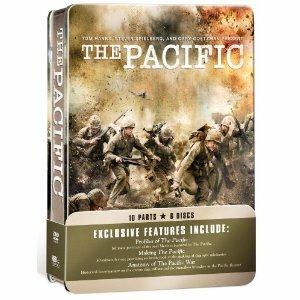 The Pacific focuses on three main characters, the three marines Sgt. John Basilone, PFC Robert Leckie and Eugene B. Sledge. The last two wrote books about their experiences. The first episodes focus on Leckie, whereas the last ones tell Eugene aka Sledgehammer´s story. This last detail is based on the fact that Eugene went to war much later than the others. He missed Guadalcanal and Cape Gloucester, one main battle and one major experience of the war in the Pacific. The mini series shows a lot of off the battle ground episodes. Soldiers on leave in Australia, Leckie´s stay at different hospitals and later we see Sledge back home. Many of this off the battleground parts look at the symptoms of post-traumatic stress of which both Leckie (in a very physical way-peeing himself-) and Sledge (more psychological-he´s depressed and has endless nightmares) suffer intensely. The series has many crucial moments. Truly gory battle scenes. Endless rain on Cape Gloucester that grinds down the morale. The realization that all they learn is “killing Japs”. There is one key scene, the moment when the two friends Sidney and Sledge meet as one leaves and the other arrives in the Pacific. Sledge wants to know from Sidney how it is to be fighting but he doesn´t get an answer. This is actually a recurring theme in war movies (there is a scene like that in The Deer Hunter and in many others): the inability of those who have experienced it to tell those who are about to experience it what it is like to be in combat. Or maybe it is not so much an inability as a refusal. They have been there, they know it´s no use. You cannot talk about something that is so completely different from anything you imagine. No one who hasn´t been there will ever know what it is like and there are no words to really convey this, nothing that equals the experience. All you have got in the face of the innocent and ignorant is silence. The Pacific shows this very well. I would like to point out specifically one further scene. It is related to one of my major points of interest namely Death. In The Pacific we see one of the most touching deaths in the history of war movies. I don´t want to spoil anything so I´m not going to tell you who is dying. What makes this scene so different is the way it is shown. We do not see the actual dying, we hear that the person died and then the corpse is being carried by some soldiers and transported through the lines of men standing there paying tribute and crying. This is a genuinely heartfelt and sad moment. A display of utter futility. Something else is very different from Band of Brothers. Even though it was WWII, this wasn´t the same war. This is not about a bunch of soldiers freeing occupied countries and captives. We have no rewarding moments like the one in Band of Brothers when they liberate people in a concentration camp. The war in the Pacific seems much more futile at moments. And senseless. And it lasted longer. The war in Europe was already over, Germany had surrendered but Japan had not. Only after Little Boy and Fat Man did this war stop. This must have been some sort of an anticlimax. By the time those soldiers came home, the whole world had already been celebrating the end of the war. The party was over and they had missed it. Needless to say that this influences the tone of the movie. For all these reasons I do not think it is doing The Pacific any justice to compare it to its older brother. It really has its moments this series. One last thing needs mentioning though and it is something I did not enjoy much. The Japanese are never ever shown in a positive light. You truly get the impression that they were a bunch of murderous automatons. If anyone wants to see a more honest depiction I suggest you watch Tora Tora Tora (1970) or Letters from Iwo Jima (2006). They both try to and succeed in doing the Japanese justice. This entry was posted in Death and Dying, Europe, Infantry Combat, Pacific, Post-traumatic Stress, WWII and tagged Band of Brothers, Death and Dying, Infantry Combat, Movies, Pacific, Post-traumatic stress, The Pacific, War Movies, WWII. I completely agree with your assessment of the two movies. Have to say that from the American experience, the Japanese were in fact either murderous or suicidal automatons, at least more so than their European Axis counterparts. What I tell my history students is not shame on the U.S. for deciding to drop the A-bombs on Japan. Rather, shame on the Japanese that it took TWO of them to finally stop the madness. Funny you should say this. I often had similar thoughts. However it is not a position that will get general approval, at least not in Europe. Agree to a point. The Japanese were certainly more fanatical and unlike their German counterparts, did not recognize when a battle was lost and it was acceptable to surrender. I would not describe that as robotic. It was more of a cultural thing. As far as the atomic bombs, it might be better to say shame on the the Japanese leadership for continuing the war after Hiroshima. But you could also say shame on the U.S. government for not being more specific in the warning about the device. I have always felt a demonstration would not have been unsuccessful, but would have left our conscience clear. Outstanding review. I would like to emphasize that The Pacific has an important them of the racist nature of the war in the Pacific. Not condoning it, just being realistic about it. A corollary theme is how war corrupts young men and dehumanizes them. Also, I would like to point out that unlike BOB, the Pacific has some significant female characters. You also get more of a feel for the home front. The producers are to be commended for not trying to make a Pacific version of BOB. It stands alone and should not be ashamed of not being as good. Thanks, you are kind. I really think it isn’t doing it any justice to compare them. They have similarities but are also very different. I did like the total concentration on the soldiers and no home front etc. in BOB and that is why I will always prefer it. But it is interesting to see the other side too. …also hats off to Rami Malek as Snafu for a fantastic performance as one of the most uncomfortable characters you will ever wish well for. I agree with what you say. It does feel like another war altogether. No one ever questioned the participation of soldiers in the so-called European theater. The Pacific is another thing. Upt to the very last moment, they never really felt like heroes, I presume. I have to have a look at the link you added. You are spot on in what you say about Malek. I couldn’t really put it into words. He made me feel very uncomfortable. I found him revolting and forgot at times that it was acting and as such incredibly well performed. Thanks for reminding me. I just had a look. That’s an amazing work of art. Wonder why I didn’t hear of it. From afar it looks like some of Anselm Kiefer’s best work. I agree that you can’t compare the two of them, it’s just not possible aside from both showing Yanks in WW2 there are no similarities between the actual stories whichis how it should be because they areboth based on true experiences of the men depicted and it wouldn’t be possible that a company of 101st Airborne Troopers in Europe fighting the gerrys would have anywhere near the same experiences as Marines in the Pacific fighting the Japanese. I agree, but people always need to compare. Unfortunately. I like Band of Brothers better but still think it wasn’t fair for The Pacific to be compared. It’s a fine series in its onw right just not as great as the other one. This is because it’s a story told from the infantry mans perspective during that period. At that point I think this was the basic infantry mans perspective of the Japanese at this time. Or may I add the basic American. This is most likely due to American propaganda at the time such as comic in the papers showing Japanese as little people with round faces slanted eyes and buck teeth. I don’t agree with it but I can say it is “realistic” to the story. “Letters from Iwo Jima” is different because it is from a different perspective. Can you tell me that “Platoon” or “Hamburger Hill” two of my favorite Vietnam movies and yours as well showed the Vietnam people in a good light? I think not. “Heaven and Earth” by Oliver Stone did but that doesn’t make it better than Platoon. I am not sure we can accurately compare these movies as they are just so different in the stories they are trying to tell. I see what you mean, if they wanted to depict the point of view of the soldiers then it is certainly accurate. No I don’t think most Vietnam movies depict the Vietnamese in another light. But when you think of a movie like Tora Tora Tora, not infantry combat, but still a very good movie, there it seemed pretty fair. No, we shoulnd’t compar. I think we can perfer the one or the other for personal reasons but they are both excellent and complement each other. and that Ack Ack’s death scene literaly had me in tears. but anyways, BoB & the pacific cannot be compared, both are epic in their own way! I totally agree. The apparoch is different, the war theater was different. They complement each other very well. I’m not going to over analyze the differences between the Pacfic and Band of Brothers to the point where it detracts or takes away from either of these two epic films. I will go so far as to say that if you have not watched the Pacific mini-series, then do so, teach your children about these hard messages of war. Make them appreciate our great Nation and understand what happened over there to our good men. This is a piece of history and understanding history the way that I do, feel it was a tremendous showing of the true grit and dispair these guys faced every single day. The music, the acting, the filming, is epic – truly a masterpiece in every sort of way. I totally agree. It’s as great as BoB and in many ways it showed an aspect of WWII which was even more tragic. While everyone was already celebrating these poor guys had to keep on fighting.